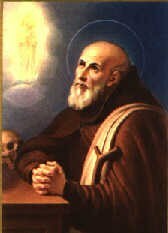 October 21, 1951 marked the date of the Canonization of Ignatius of Laconi, Capuchin Lay Brother. Born on December 17, 1701, Francis Ignatius Vincent Peis knew poverty from his very beginnings, but the home of the Peis had a distinctly Christian atmosphere. His father was a quiet, hard-working man while his mother, a pious woman, taught him to pray. From his earliest years, Vincent was prone to sickness and when he was 18, he became ill for many months and remained bed ridden. Turning to the Blessed Virgin for help, he repeated a pledge his mother made before his birth, promising to become a Capuchin if Mary would only cure him. To the amazement of many, Vincent began to recover, but alas, as happens to many promises to the Divine, he forgot his! Not long after, he had what would have been a fatal accident had it not been for the intercession of the Blessed Virgin. Again, he had implored the aid of Mary and vowed to fulfill the forgotten, but now remembered promise. This time he was faithful to his promise. He journeyed to Cagliari to the headquarters of the Provincial of Sardinia, on the hill of Buoncammino. After some difficulty, Vincent began his Novitiate for the lay brotherhood on November 10, 1721, at the friary of Saint Benedict, within Cagliari itself. He received the Capuchin habit and the new name of Brother Ignatius. Immediately following his profession, he went to the Friary at Buoncammino and for two years, he was the cook. Then for ten years, he was questered at Iglesias Friary, following which he returned to Buoncammino as a weaver. However, within a few short years in 1741 he returned to his task of questing. At this job, he remained until his death in 1781. Therefore, his "work" consisted mostly of daily walking the streets of Cagliari and begging food for the friars. Very soon, he became a familiar figure to the people and became known as "Padre Santo." He won the love and confidence of the old and he captured the hearts of the young. The children of Cagliari were particularly fond of their "Padre Santo" with the forked walking stick, the white beard, and the faded brown habit. He would tell them stories of saints, and talk to them about God, teaching them to love him and to talk to him in prayer. The passion became an integral part of his daily life, and it was from this source that came the wisdom, warmth, and vitality that the friars and the people found so appealing. Being a man so close to Jesus, it seemed fitting that he should die with him, and so it was, on Friday May 11, 1781 at 3:00pm he passed this world.